My real lashes are not full enough and this type is a perfect match for my eyes! Love them! I just got my 3rd Love- Aflare today! These are my go to lashes. The value is great! I have been happy with the quality and the subtleness of these lashes! Love a flare is definitely my favorite! 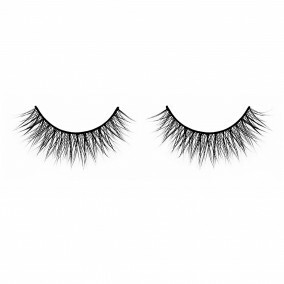 These lashes look chic and are very wearable during daytime! It’s looks very very natural, but still emphasizes my eyes…. which I really like. I already used them 12 times and they still look great! Very happy with these eyelashes. I used to wear synthetic strip lashes from Asia, but these are much more natural. I wanted full and beautiful lashes, that people notice, without looking obviously fake or unnatural. Highly recommended. I’ll try ‘Ooh La Lash’ after this!